Stayed up late to finish this one. Brilliant. 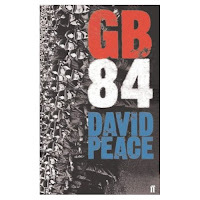 It's a novel set during the 1984-1985 Miners strike. Like his more recent book on Brian Clough - The Damned United, Peace tells the story through a series of monologues interspered with staccato stories of some key characters in the strike. Dirty Tories. Bastards. And the scabs. Dirty bastards. Secret state. Stop at nothing to crush our class. Based on real characters like David Hart (the Jew), Roger Windsor (Terry Winters). Scargill and Thatcher are viewed from a distance.